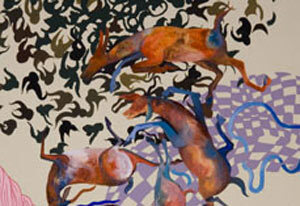 Shahzia Sikander, born in 1969, is an artist from Lahore, Pakistan. Sikander is a Pakistani American artist, now living in New York City, who specializes in Mughal Miniature Painting and Persian Miniature Painting. She has also created murals, installations, mixed-media works and performance art. Sikander has been schooled in the miniature painting tradition of Pakistan, and combines the historic iconography and technique with her own aesthetics resulting in a hybrid of traditional and contemporary styles. The imagery in her work references the tensions that exist in Islam, Hinduism and Christianity as well as her personal history, politics, and sexuality. Religion is a significant element in her art as well as her personal life, as she is a practicing Muslim. Sikander explores in particular, the role of Muslim women and challenges the view Westerners have of associating Islam only with terrorism and oppression of women. A Muslim from Pakistan working and living in America, Sikander has explored stereotypes of Eastern and Pakistani women, and issues relating to the Hindu and Muslim divide in Pakistan and India. She has transformed a traditional art form – the highly precise and often impersonal genre of miniature painting – into a contemporary art context, and she frequently mixes imagery from both Hindu and Muslim mythology and iconography (like the Muslim veil and the Hindu multi-armed goddess), paralleling the complicated and interwoven nature of Indian and Pakistani history and culture. Sikander has also experimented with wearing a veil in public (which she did not do before moving to the United States), and has characterized this as a form of performance. Through out her carrier she achieved many National and International Awards. She is a 2006 recipient of the MacArthur Fellows Program "genius grant". She earned a BFA in 1992 at the National College of Arts in Lahore, Pakistan; and an MFA in 1995 at the Rhode Island School of Design in Providence, Rhode Island, in 1997 Core Fellowship Award at the Glassel School of Art, Museum of Fine Arts, Houston, The Louis Comfort Tiffany Foundation Award in 1997, and many more. § Hirshhorn Museum and Sculpture Garden, Washington, D.C.
§ Musée d'Art Moderne de la Ville de Paris/ARC, Paris, France. § Center for Contemporary Art, Athens, Greece. § Rotherham Art Gallery,Rotherham, England. At time the artists would take up challenging topics and test our tolerance but such matters must be handled with care. A culture of mutual respect is a responsibility for the artist just as much as it is for the critic. Institutions such as the National College of Arts that have incubated artists such as Sikander deserve our support. Even when the artists leave Pakistan and their work blossoms and takes on its unique global form, their resonance is felt in their ethnic homeland and provides inspiration to other creative minds who defy conventional career trajectories.